Auto-responders, or auto-replies, can be really useful web tools or the bane of your existence, depending on how you use them. Many people dislike receiving automated replies when they’ve spent time crafting an e-mail, but used the right way, auto-replies can be helpful. You go on vacation and want to let people know you won’t respond until after a certain date. You’re particularly busy and need a way to tell people they may get a delayed response to their e-mails. The e-mail box is for a customer service e-mail address or something similar. An auto-responder can let the customer know that his query has been received and can give him an estimated response time. You have an e-mail address that is only used for sending mail and replies are not read by anyone, and you want to notify the sender that she has contacted that e-mail address. Log in to your control panel and navigate to the mail section. 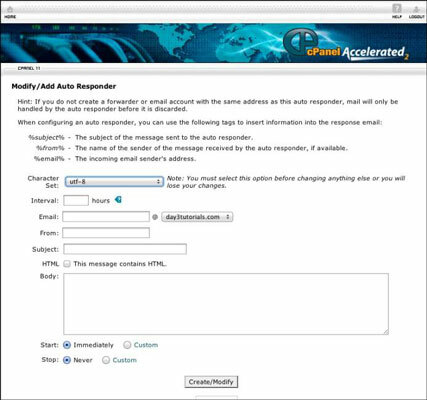 The Modify/Add Auto Responder screen opens. In the Email box, enter the e-mail account you want the auto-responder to be associated with. In the From box, type the name you want the e-mail to say it’s from. This could be your name or Customer Service Team or whatever is most relevant. In the Subject box, type the subject line you want the reader to see. This could be something like Out of Office or Thank you for your inquiry. Type the main topic of your e-mail message in the Body box. What you enter here will vary depending on the purpose of the auto-responder, but in general your message should explain why the auto-response has been sent and give some time frame for a non-automated reply. Set the start and stop dates for the auto-response. This is important. You don’t want your auto-responder still telling people you are on vacation when you’ve been back a week. Make sure your vacation notification is off when you get back. Don’t set up an auto-responder that says you’ll reply within two hours if you rarely reply the same day. Don’t give too little information. “I’m on vacation” doesn’t tell the recipient anything. He doesn’t know when to expect a reply. Don’t give too much information. People don’t need your schedule for the next two weeks. A simple explanation that you’re busy and an idea of when they can expect a reply are sufficient.